We provide our 400+ undergraduate students a variety of options with six areas of interest: pre-vet/pre-grad, equine science, business management, food science, animal production, and animal biotechnology. These options allow students to gain industry specific experience for a wide variety of animal-related careers. 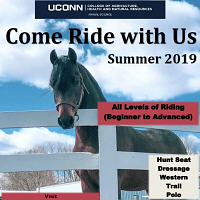 Registration is now open for the UConn Summer Riding program. Click here to see all of the available options and to register today! The January 2019 newsletter is here! Read the newsletter by clicking the link above or click here to download the PDF! Join us for our weekly seminar series held every Friday from 12:20 to 1:10 PM in the George White Building. See the spring 2019 schedule here. See information on this week's seminar speaker here. The Department of Animal Science offers a select number of quality horses for sale throughout the year. See the current sale list here. Read more about the current research in the UConn Department of Animal Science above!